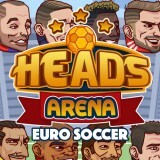 Heads Arena: Euro Soccer:Use your giant head to bounce the ball into the goal! This hilarious soccer game pits you against some of the best European athletes. You can choose from a dozen different teams, each with unique star players. Play with or against a friend in Heads Arena: Euro Soccer!